With my boss doing some extensive traveling, I'm taking days off when I am able. He left yesterday and doesn't return till April (he's going to work from Paris and London, though, people, it's not all vacation). Yesterday I might have labeled this SETBACK, today I'm trying to frame it as continued care. My thumb needs to be immobilized for a while. 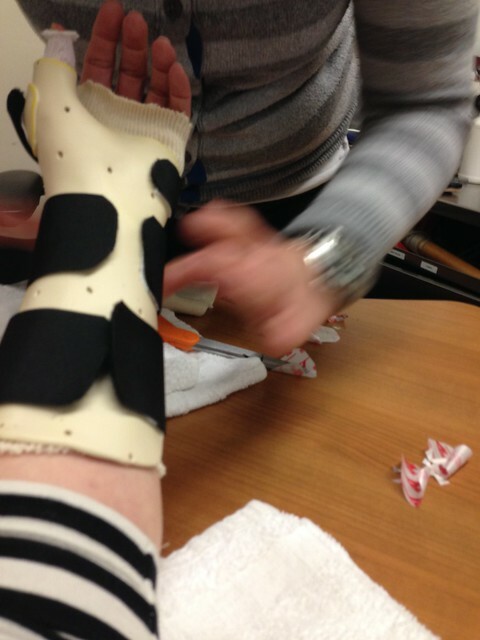 Weak ligaments, fluid in the joint...the schmancy surgeon ordered a daytime splint and a nighttime splint. My darling physical therapist saw the disappointment in my eyes and worked hard to be encouraging. I see the doctor again in five weeks and am hoping this phase will be done. Meanwhile, I feel more every day and am amazed at how much pain the Lyrica must have masked. So, actually, that turned out to be a treatment I initially resisted but was necessary. I am hopeful that if I follow my instructions this time it will be equally as successful. All my snow-wishes have come true. Snowing again all day today. I'm sorry, everyone, I love it. Beautiful rings on the subway last night. My gorgeous co-worker K helped me tremendously by making a call to Italy. It's a shame I didn't capture more of it - she has a lovely voice and her Italian was impressive! I have a major crush on her. I'm watching Susan Graver on QVC this morning (terrible website, eh?) and I want cropped leggings and a modal cardigan and a drapey washable "silk" top. I'm off to make an egg! Glad the snow isn't wasted on you! Snow is lovely if you can sit inside and watch it while drinking a cup of tea. Cropped leggings are my winter pants, under a cotton dress and light cardigan. Patience. Dad is in surgery RIGHT NOW, knee replacement. I am so looking forward to his therapy. Wish I could help with your Italy calls. Snow. 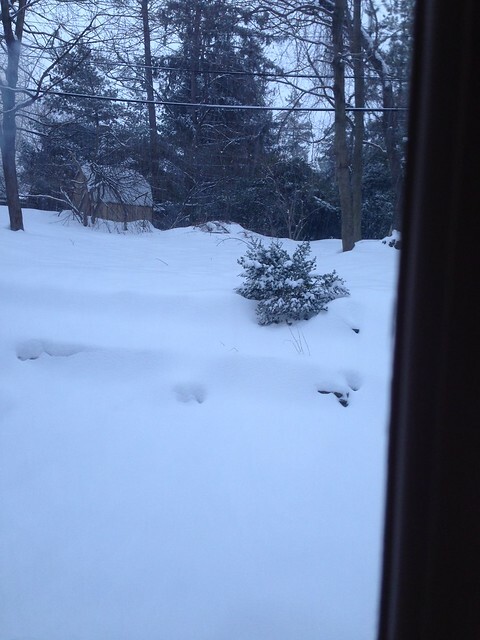 A lot of snow. I like snow and winter, too, but when the weather suddenly warmed up earlier this week I remembered SPRING! And now I am looking forward to it. Winter can just leave now until next November.